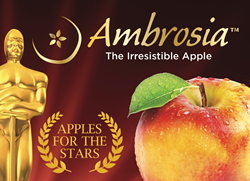 Ambrosia™ apples are proud to step up as a first-time, fresh produce item in the Oscar Nominee’s official gift bags. Ambrosia apples for the stars! “Ambrosia apples really are exceptional, worthy of Hollywood’s best,” said Steve Lutz, Vice President of Marketing for Columbia Marketing International, Inc.
With the countdown to the 87th Annual Oscars® in full swing, Hollywood’s biggest night beckons with the allure of the red carpet, golden statues and glamourous celebrities mixing it up with the evening’s nominees. But for those Oscar hopefuls who don’t win the major Academy Awards categories of Best Actor/Actress, Best Supporting Actor/Actress and Best Director – there’s still a happily-ever-after waiting in the wings, thanks to Ambrosia™ apples. Ambrosia™ apples are proud to step up as a first-time, featured item in the official gift bags that non-winners in the major categories receive. Ambrosia™ apples stand out as the only fresh produce item to be included in this year’s gift bag, and will join an impressive $80,000+ worth of merchandise as part of the “Everybody Wins at the Oscars®” nominee gift baskets. With a name that means “food of the gods,” Ambrosia™ apples are right at home on Oscars night. 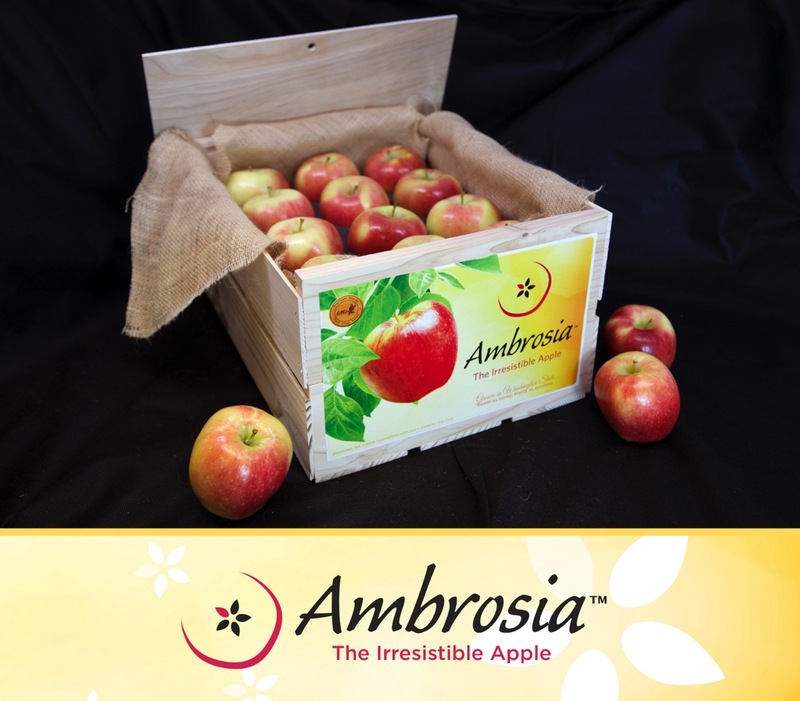 Ambrosia™ is a relative newcomer on the American-grown apple landscape, after being discovered as a chance seedling in Canada. They truly are the ultimate eating apple. Perfect for snacking or enjoying with wine and cheese, Ambrosia™ apples are incredibly versatile with their creamy flesh and sweet, honey-like flavor. Ambrosia™ apples in the United States are exclusively grown by McDougall & Sons, family-owned fruit farming company in Wenatchee, Washington with roots going back over 100 years. All Ambrosia™ apples are non-GMO. After 10 years of orchard development, both organic and conventionally grown Ambrosia™ apples are now available nationally in leading food markets. One Ambrosia™ apple retails for approximately $1.00. About Columbia Marketing International, Inc.
U.S. grown Ambrosia™ apples are exclusively distributed and marketed by Columbia Marketing International, Inc. (CMI). CMI is one of Washington State’s largest growers, packers and distributors of premium Washington State fruit. In addition to Ambrosia™ apples, CMI is the exclusive grower of Daisy Girl Organics™ and Kanzi® apples; is one of three U.S. growers of Kiku® brand apples; grows and distributes Honeycrisp, Fuji, Gala, Jonagold, Cameo®, Golden Delicious, Red Delicious, Braeburn, Pink Lady®, Granny Smith and Grāpple® apples; and additionally produces an assortment of pears and cherries. CMI is dedicated to distributing premium quality fruit, including many organic options, throughout the United States and to international markets. For more information, visit http://www.cmiapples.com and http://www.mysweetambrosia.com. Neither Ambrosia™ nor Columbia Marketing International, Inc. have an affiliation with AMPAS® or the Academy Awards®; the “Everyone Wins” Gift Bag is an independent production of Distinctive Assets. For your chance to win an Oscar gift pack of Ambrosia make sure to visit us on Facebook!